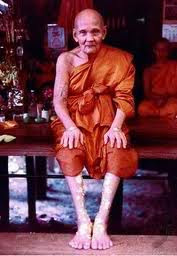 Luang Poo Doo (officially called “Pra Prompunyo”) was born on May 10, B.E.2447 in Uthai District (Ayuttaya Province). His parents Mr.Put and Mrs.Puang were farmers. It seemed like he was destined to be a famous monk since the day he was born was one of the most important Buddhist days, called “Visakha Bucha Day” - a day to commemorate the birth, enlightenment and death of Lord Buddha. He was just a little baby when a strange thing happened on one rainy day. It was raining so hard that their house and all the surroundings were flooded. The parents was very poor and therefore aside from daily farming they were also making little snacks to sell at the downtown-market. On that day, while they were cooking, they suddenly heard the dogs barking loudly. When they came out to see what was going on they almost fainted because their little baby, Doo, was floating on the river, flushed away from the yard by the quickly growing stream. The baby was lying on a big pillow, which helped to save him from drowning and Mr. Put managed to bring the boy back home. However the incident made his parents believe that their baby had some magic power that had helped saving his life - otherwise he would have been killed by the wild river. Unfortunately Mr.Put and Mrs.Puang had no chance to see Luang Poo Doo ’s success in the priesthood as they both passed away around the time when Luang Poo Doo was just 4 years old. He had become a little poor orphan who was raised by his grand mother and sisters. They later sent him to be educated at Wat Pradoosong Dharma. Luang Poo Doo had begun his education at Wat Pradoosong Dharma, where he was ordained as a novice. When he’s 21 years old (May 10, 2468), he was ordained as a Buddhist monk at Wat Sakae by another famous sacred monk named Luang Phor Klun, the abbot of Wat Pra Yatikaram (as well as Luang Poo Chai, the abbot of Wat Klang Klongsrabua and Luang Poo Dae, the abbot of Wat Srakae). After that he had moved to stay at Wat Sakae to continue learning higher levels of Lord Buddha’s Dharma as well as to spend the most of his life. Soon he started learnig Dhamma from many senior monks including Luang Phor Klun, Luang Phor Nueng, Luang Phor Chom, Luang Phor Rod and Luang Phor Pao. Particularly Luang Phor Klun had taught him about meditations, which was the most important science that would later helped him to become a famous magic-power expert, as well as Luang Por Pao, who was teaching him a lot of magic sciences which later helped to create sacred amulets to help protecting people from danger and evil. Luang Phor Doo, just like other sacred monks, tried to learn various magic sciences. To get the right experience he set out for travel to the deep forests in Karnchanaburi and Supunburi Province. He also stayed at the very respected sacred shrine “Pra Tandongrung”. It was recorded that at the time he was very interested in sacred tattooing, and got tattooed on the most of his body. However later, when he grown older, he considered that sacred tattooing was just a magic science that does not really help people being truly unleashed from the circle of creatures (comprising the birth, aging,, being ill and dying). That's why he had turned to be more interested in meditations, which was accepted as the best way to help developing the human soul to be purified and powerful enough to leave the circle. Actually Luang Poo Doo was really lucky because of his teacher Luang Por Klun, who showed him how to practice meditation by controlling his breath by both, the inhalation and exhalation. By the way, when he inhaled he would say “Buddh” and when exhaled he would say “Dho”. By the practicing his mind, one becomes to be more and more purified and his soul would get closer and closer to Lord Buddha. For ordinary people it isn't that simple because human hearts naturally lack the concentration. Sometimes you might be worried about your family, your children, your businesses etc, and therefore it is quite necessary to practice meditation at the right place and under a sacred control and help of monks. That’s the main reason for some people can be successful in meditation while others are not. All the people, who were led by Luang Poo Doo were really lucky because apart from the senior monk’s heartfelt dedications, his sacred power would also help to protect the peoples' souls from spirits that might try to obstruct or disturb them while they are meditating. There was annoying period when Wat Srakae was often visited by thieves who kept regularly stealing various things. LP Doo was trying to find a way to get rid of them and he had found the name of “Archarn Choti”, a famous ancient monk, who used to have a special spell that could help tu push the thieves away. A young man visited Wat Sakae and was ordained a Buddhist monk by LP Doo, who had also helped teaching him to practice meditations. After some time this young monk approached LP Doo with an amazing question. “Have you ever known Archarn Choti?” The question really surprised LP Doo since he had been waiting for many years for any response from the ancient sacred monk. “Yes, I have.”, replied Luang Poo Doo. “Archarn Choti had come to me in my meditations and wished to tell you that you should be interested in that sacred spell because these spells are black magic and it would hinder you from your future enlightement.”, said the young monk. Luang Poo Doo was very famous for his simple way of teaching Lord Buddha’s Dharma. He would always tell an easygoing story that could be easily understood by the rustic local people to help them find the true instructions of Lord Buddha. One of his most famous story was called “Kumarn Hoo-tum”. The story was about a millionaire, who was mean and never wanted to pay money in any way even when his son named “Kumarn Hoo-tum” got seriously ill and needed some help. Eventually the boy died. Because of the mercy of Lord Buddha, before he had seen a miraculous light, caused by Lord Buddha’s sacred power. He recognised that the light Lord Buddha's mercy for all creatures. At that moment the boy fell to respect to Lord Buddha and after his soul had left his body he was born in heaven and was renamed to “Mutta Khuntasi Dhepbutra”, and blessed to stay in heaven forever. Luang Poo Doo was famous for his mercy for all creatures and everyone, who visited the temple, would be allowed to touch his mercy. LP Doo would never refuse welcoming them despite being very tired, after working hard all day. “Just only thinking of Lord Buddha’s mercy could cause you a lot of virtues. Therefore if you often remind yourselves of Lord Buddha, Dharma and Sangkha you would surely gain lots of virtues that would lead you to heaven after you have passed away.”, used to say LP Doo. “If you want to be successful you must begin to do something, not just only waiting for miracle to help you. Lord Buddha is the best example, he went through everything - he suffered from various tortures before he could be enlightened and so should do all the creatures, if they want to follow Lord Buddha’s way. Just begin today, and success will be waiting for you indeed - sooner or later, it just depends how hard you’ve tried. ”. In around B.E.2527 Luang Poo Doo ’s health became worse. He had to visit the hospital several times, and was found to have a serious heart disease. Although it was suggested to him to stay at the hospital for many times until his heart becomes better, he refused and stayed at the Wat. He was simply felt so responsible for the Buddhism activities and all of his followers at the temple. LP Doo kept on hard working until the year B.E.2532. Lots of people were visiting the temple to listen to his teachings, without realising that the old monk was seriously ill. LP Doo never complained about his weakened health, he had just kept on teaching Lord Buddha’s Dharma to all visitors. In the morning of January 16, B.E.2533, Luang Poo Doo welcomed the visitors with his face smiling as usual. No one seemed to be alerted that this famous monk would leave his body tomorrow. In the next morning ( January 17, B.E.2533, at 05.00 a.m.) the monks and novices in the temple found Luang Poo Doo passed away. He was 85 years and 8 months old. His body was buried during the official funeral under the King’s patronage on April 20, B.E.2534. He had served Buddhism for 65 years. Although LP Doo has been away for more than 16 years, lots of people keep visiting Wat Sakae every year to organize a Buddhism ceremony dedicated to him and his work that helped to lead many people to successful ways of lives. Due to his reputation in possessing supernatural powers and mastering magic sciences, many people seek his amulets. Many stories about his amulets' supernatural power are circulating among Thai people (the amulets saved many lives and some of them also helped poor people to win lottery prices). Because of their brilliant reputation it is quite hard to get a genuine amulet by Luang Poo Doo. Besides the fact that there is always a huge lot of fakes at Thai amulet market, Luang Poo Doo made so many series of amulets that it is really difficult to remember and distinguish between the true and fake amulets. The most famous of his amulets are probably the silver rings. They were made of 12.6 - gram gold and called Prohmpun-yo rings. Others are phra phrom and lp thuat. Also, one of LP Doo ’s most famous series of sacred amulets was called “Rian Perdloke (= Open The World)” - a sacred coin with the portrait of Luang Phor Tuad embossed on the front side and on the sacred endorsement and the name of Luang Poo Doo of Wat Sa-kae on back, together with the Thai number identified B.E.2532 (which was the year that this series of amulets was made). The followers of Luang Poo Doo revealed that Luang Poo Doo would tell them them that while he was reciting the sacred spells to create the Rian Perdloke his mind could touch a miracle light that had penetrated into the three worlds.